Written on March 30, 2007 by Rylan & Kaitlyn. Wow, what a week I have had. Monday night was certainly not fun falling, splitting my head open and then having to get tortured at the hospital. Mom and dad have been torturing me as well each night because they have to keep it clean. I really really hate being held down while my mom does anything to it. I hope I never need to go through this again. I have been through enough trauma to last me through the next 10 years. Other than my wicked gash, there haven't been that many exciting things going on. My mom noticed recently that I have begun showing signs of being afraid of the dark. I have always gone to sleep with a small night light plus my soother which lights up. Lately though, I have wanted the bathroom light left on and it has helped a bit. I think that the shadows on the wall are both interesting and scary. My mom and dad do a good job soothing me though so that's good. Speaking of shadows, the other day I was playing with mine downstairs. I was watching it while I would kind of dance. Amazingly, it was doing everything I was. It sure is fast to keep up with my lightning fast dancing skills. We stopped by our new house that hasn't yet begun building but others have. It's just a matter of time. Dad is super happy because they lowered the price on it. Whohoo! The partially built ones are excited to walk through. I get to see where my room is going to be. It's pretty darn exciting. Have a safe weekend and please watch out for sharp edges! Three stitches to the head.. Written on March 28, 2007 by Kevin. For the past couple of days we have been going from store to store looking for a specific type of potty for Rylan to begin using. We have been super excited about this until we stepped into the Target Greatland store. While my wife was looking at some clothes, Rylan was walking me around the store while hunting down things that interested him as well. We stopped by the bra department (sigh), the shoes and back to the kids section to hunt down mom. At that time, the worst thing that could have happened, did so. Rylan had tripped and slammed his forehead into the edge of a clothing shelf. I immediately picked Rylan up my heart just dropped. He was bleeding. I rushed around looking for my wife and then we headed up to the front of the store to get some ice and something to help stop the bleeding. Quickly, we had Target employees around us trying to comfort us but it wasn't going to help. They wanted us to stay around to fill out paperwork but we insisted on leaving as he had a deep gash in his forehead that most likely needed stitches. We quickly got to the Mayo Clinic emergency room and waited. At this point, Rylan had calmed down and was back to his old tricks like nothing had even happened. I don't know how he does it. It took a bit to finally see a doctor and she confirmed the need for stitches. They gave him a bit of numbing medicine on the cut and then they proceeded to bundle him up in a sheet and restraining harness. They gave a bit more numbing medicine, cleaned it out and then stitched it up. This was possibly the worst 10 minutes of my life. The screams that Rylan had and the face of fear were extremely difficult to handle. He began to shake his head back and forth like he knew exactly what was happening and was begging us to stop. I can't imagine what would be more difficult to watch. Rylan is doing much better now but I am not sure if I will ever fully recover. When you think being 2 feet away from your child is close enough, something comes up and your life is turned upside down. Written on March 26, 2007 by Kevin. Can you imagine your life without your children? I know that I cannot. Rylan's first trip to the zoo. It has been scorching hot here in Arizona over the past couple of weeks so when the weather broke and we had some rain, we knew we needed to take advantage of it and head off to the zoo before it got much hotter. We headed to the Wildlife World Zoo. Home of the baby white tigers and even a white alligator. We covered Rylan in some good ol' sunscreen and made our trip around the zoo. 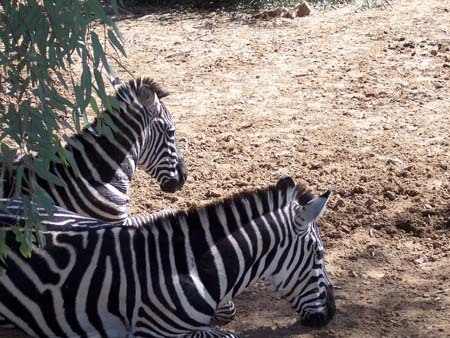 The first thing that we noticed was that animals that were in the first exhibit, were to be found elsewhere in the zoo. It put a bit of a damper on things when we continued to see the same animals over and over. Rylan was thrilled to see all of the animals. He was so excited to see the tigers, birds and monkeys. Anything that caught his eye was simply amazing to him. He is a huge fan of our 2 cats at the house so when we told him to look for the big kitties his eyes lit up. I took my wife to the Phoenix Zoo before we had Rylan and I think that I enjoyed that zoo a bit more. It seemed to be a bit fine tuned while the Worldlife Wild Zoo seemed to be all thrown together. The housed rooms which contained primates, reptiles and fish were as humid as possible and stepping back outside was refreshing, despite it being about 80F. Would we go back again? Possibly. The use of a freebie coupon certainly made this trip a bit easier on the bank account. The price otherwise is affordable ($18 per adult, under 2 is free) but when you see that they have no one checking you at the door, you question why you even paid in the first place. Drinks and food, as you can imagine are over priced. I do not think that this is a frequent stop for family outings but an annual visit may be likely. Rylan, on the otherhand, would want to be there all of the time. He did amazingly well. Written on March 23, 2007 by Rylan & Kaitlyn. First off, it has been raining here in Arizona since yesterday and boy is it wonderful! The last couple of weeks have been amazingly hot. I mean like 99F hot, in march! Crazy! I really like walking through the rain so it is really exciting for me. So, there is whisper around the house as of late that I may begin potty training soon. I think I heard them talking about the signs when your child is ready to try and they said I now am experiencing most of them. Well see what happens. We went over to grandma's house last Saturday to eat dinner. That was a pretty good time. She made chicken, green beans and pasta salad. We had so much leftovers that my mom tried to make some wraps for me the next day but I wasn't too interested in that. I really like it when my grandma makes meals for me because they are always really yummy. She likes to hand out cookies freely as well. Regardless of what my mom or dad says. I know someone who is going to get in trouble one of these days and it's not me this time. The power went out earlier this week so my mom took me to the mall to hang out at the play area. Boy oh boy was it packed. There were a bunch of older kids running around super fast so it wasn't that fun. We ended up taking off and eating some food at the Paradise Bakery. That was pretty darn yummy. We stopped by the library for the first time this week as well. Wow, I thought I had a lot of books but this place is amazing. I have 2 full bookcases filled with books that my mom and dad have purchased over the years but nothing compares to the library. They even have a huge selection of kid DVDs that we can borrow 10 at a time. We picked up a bunch of Jay-Jay the Jet Plane and Berenstain Bears movies. We will certainly be heading back their often I think. I think mom is looking into taking me there during the day occasionally so we can check out their story times. That should be pretty darn fun. I think thats it for now. Have a good weekend and watch out for rain puddles! Written on March 22, 2007 by Kevin. Each night we put Rylan to sleep and then go lay down in our own bed to essentially watch him from afar. When he is having a really tough time we encourage him to lay down in which he normally cries a bit and then passes out. Normally the process doesn't take more than 15 minutes. We figure this is a good alternative to putting him in bed, taking off and let him cry himself to sleep. This is a bit of a play on the Super Nanny idea which is basically getting your child to sleep by being visible but not responsive. The other night we did our normal routine and then went downstairs for a few hours. When we returned upstairs to head to bed ourselves, I noticed that one of Rylan's toy baskets was turned upside down. I was pretty sure that I didn't need to step over it when we left the room. He must have been up walking around playing and then headed back into his bed to sleep. This is despite having the baby monitor turned up as high as it can go. We brushed it off as a random occurance and went to bed. A few hours later I woke up for whatever reason and noticed Rylan sleeping in the middle of the room on the floor. I decided that I would let him sleep on the floor as he was clearly passed out. Some time later I woke back up, again for no apparent reason, and I noticed Rylan this time sleeping on the floor near the door. This time I picked him up and placed him back into bed. He slept through the rest of the night. I am curious to see if he is really sleep walking already at 17 months or just waking up and wanting to play. My mother tells me that I was sleep walking around 2 years old so it does not seem unlikely. Eating chocolate within 5 hours or so of sleep will most likely cause me to sleep walk, can Rylan have something similar? We recall giving him a cookie a few hours prior to sleeping so maybe he caught my problem. I get to now experience what my parents and now my wife do. I have always wondered what a sleep walking person looked like. While I hope Rylan doesn't have it as bad as I do, I look forward to helping him with the issue. We have noticed that Rylan has also been whining in his sleep more lately. It seems that his imagination is in high gear and he must be having bad dreams. What could Rylan be having bad dreams about? Going to school without a diaper? Getting told no when he tries to do something bad? This could get interesting. Our trip back to Cabelas.. Written on March 21, 2007 by Kevin. As mentioned in the past, we are always trying to get Rylan out of the house after I get home so that he doesn't feel cooped up all day. It dawned on me yesterday that we had not gone back to Cabelas in a while. Our first trip was posted about here. For those who do not know about Cabelas, it is simply an outdoor sporting store with quite a bit of stuffed animals and a huge fish tank. 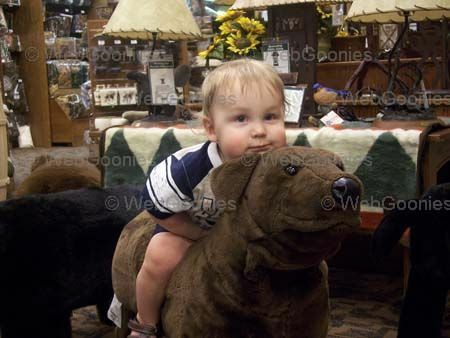 We took Rylan to Cabelas so that we could get some food and show him the animals again. The food was OK. We were there later in the evening so it turns out the food was sitting out for a bit. Rylan enjoyed his pizza though and loved sticking his fork into some ketchup and eating it. He enjoyed tasting a bit of strawberry cheesecake fudge that we had a chance to sample. He washed it down with some iced tea which blew us away. A little kiddo that likes iced tea? He amazes us. We walked around the large store and found just about anything to point at Rylan. He couldn't get enough of it. We snapped photos with all types of animals and we let Rylan run loose through some of the areas as we were curious to see what animals peaked his interest. He really enjoyed looking at everything it seemed and never got scared. My wife made her way to the center of store which happens to have childrens clothing including shirts that read "Dads little fishing buddy" which would be great for Rylan and one that said "Well Bred" for our daughter on the way. Rylan wasn't too interested though in shopping and decided to run off to a waterfall exhibit that they have which has even more animals. If he had his way, he would have slipped through the fence (one foot spacing between bars) and lived with the animals. We finished off the trip with a walk through the huge fish aquarium. Rylan did more running than walking and couldn't stop pointing out fish that he liked. From one side to the other we went pointing and talking about the fish. He was quite bummed when we told him it was closing time. It was another successful night giving him something new to dream about at night. Written on March 20, 2007 by Kevin. My wife is now just over half way done with our second pregnancy. Things continue to go well, especially compared to Rylan's pregnancy. Sickness is at a minimum and besides general cramps and other pains, she is doing great. This time last pregnancy, I recall my wife already having needed a lot of blood drawn but this time around I think we have gone only once so far. The less the better as we both have troubles with the needles. Needless to say, we are not looking forward to the gestasional diabetes shots that she will like need to have done. We see signs of swelling in her feet so we are trying to keep salt intake to a minimum and having her keep her feet up when possible. I recall a post I made back in September of 2005 when my wife was pregnant with Rylan. The post was simply called The shoes have shrunk.. which lays out my wife's wonderful swollen feet. It really is amazing on how much they can swell. A few weeks ago my wife began feeling the baby girl kicking and just last week I was able to finally feel some kicks from the outside. Definitely an exciting time which really locks in the fact that you will be a parent again. Written on March 19, 2007 by Kevin. Rylan decided to surprise us with a new skill this weekend. He has now learned how to pick his nose. We were really hoping this day would never come but none the less, we still love the little guy. What could be more funny looking than your son picking his nose for the first time? Watching him wipe it on his mom. It was something we never would have expected but it certainly was a good laugh at the time. My wife had been noticing recently that boogers would end up on her pants and she had no idea what it was until she saw Rylan picking his nose. He must have been doing this for a while now without us noticing. We are still trying to figure out where he learned this crazy skill from. Who can we point the finger at (no pun intended). Written on March 16, 2007 by Rylan & Kaitlyn. This week has been a week of new things. My dad has been on a mission to getting me to try new fruits so I have had a few different types of pears and apples. My mom gave me a banana yesterday. They are one of my favorites. I remember when I went to Disneyland one time and I passed out asleep while eating one. I really like these new fruits because my dad cuts them up like French fries. So now I have pear fries and apple fries. Yummy Yummy! I think my dad said he may give me some kiwi or mango soon. I surprised my mom this morning. She was thrilled when she woke up to find out that I had basically gone nutty on our room. Without making a peep, I dumped out all of my toys, opened up the closet and brought a bunch of stuff out. It was really really fun but I bet it wasn't too fun for my mom who had to clean it up. We have to keep the house super clean because of it being up for sale. I guess I will need to make up for the mess with extra kisses for her later. My dad went on a bit of a shopping spree, well at least from his normal spending. We bought a couple of the Disney Sing-A-Long DVDs. My dad tells me that he used to have a bunch of these on VHS so I think he is excited about watching these with me. I can always count on him to sing the words and dance with me. My mom found a bunch of girl clothing on EBay so he also bought those. Of course those are not for me but it's OK. I think my little sister will like them because they are pretty cute. Speaking of Disney, last night we spotted a television show about the Disney Cruise Line. Boy does that look fun. I got to see Mickey Mouse and a bunch of his friends. I think it would be really fun to go on a cruise but I think the Disney one would be best. Probably the next best thing to visiting Disneyland itself. Earlier this week we stopped by Mimi's Cafe. Before we even ordered, they came out with a special plate for me. It included Cheerios and orange slices. I really like having a special plate for myself. I ended up having a turkey dinner which was De-Li-Cious! I ended up having leftovers which were also good. They finished the meal off with 'worms in dirt' dessert which was pudding, a gummi worm and Oreos for dirt. Dad got to eat the gummi worm so he was super happy. Think that's about all for now. Maybe tomorrow I will spot a leprechaun or at least go find a four leaf clover. I need all the luck I can get when my sister comes and keeps us all up at night. I am certainly not looking forward to that! Written on March 15, 2007 by Kevin. 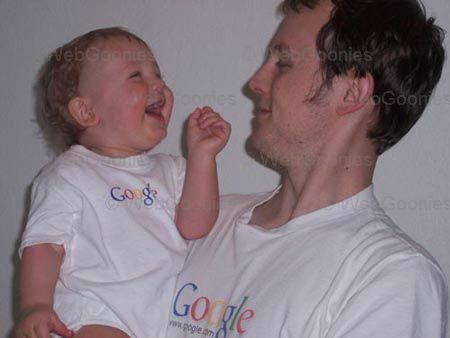 Before Rylan was born I had mentioned around that it would be great to get a Google onesie for him. I always felt that it would go great with my Google tshirt that I got years ago. It wasn't too long after mentioning it that one of my old coworkers picked it up for me. It's been a long time coming but now Rylan finally fits into it. I can't wait until we take him out and people take a glance. I think he should be getting a few interesting looks. Looking at the Google Store now, it appears that they have removed all kid related items which is unfortunate. They used to have shirts and a few other things if I recall correctly. Maybe they will bring them back some day. I think the Google onesie may have just turned into a collectors item. Written on March 14, 2007 by Kevin. I am sitting here at work wondering what my wife is doing with Rylan. Looking at the time, my guess is that they have not yet awaken. Any minute now though. Everyday they seem to do the same thing. Wake up and eat breakfast which normally includes milk and a couple of waffles. From there, Rylan has his favorite Disney shows such as Mickeys Playhouse, Little Einsteins and The Doodlebops. Once those shows are up, its playtime and then nap time. Everyday is the same thing and I can only imagine that it could be difficult for both my wife and Rylan. I am wondering how other stay at home parents deal with the same ol' same ol' each and every day. I am very curious to see what types of things other parents do with their children as young as Rylan. I am looking for something to break up the day as to not make it feel so long for the both of them. We would love to do more crafts and other fun stuff with Rylan but we just can't think of many great ideas. Please leave a comment with any suggestions. A new stroller is due. Written on March 13, 2007 by Kevin. Having a second child allows you to reuse a lot of your old items such as cribs, bouncers and playpens. One thing not really usable though is a single seat stroller. We have been looking for a new stroller for a bit now until we stopped by the Burlington Coat Factory and found what we were looking for. I was a bit surprised on how many different strollers are offers at that store but we quickly tracked down the one we were after. The Evenflo Take Me Too! tandem stroller. We initially found a pattern that we liked that sold for $149.99 but with a short walk around we noticed that for only $89.99 you could get what appeared to be the identical stroller but with a different pattern. A $60 difference only for a change in pattern? I was hooked. Last night, the stroller finally came in so we went ahead and picked it up. Rylan as always wanted to help put it together but we went ahead and had him sit it out while we did the work. After it was put together, Rylan was thrilled. He immediately wanted to try out each seat so that he could stake out his claim. For the first bit atleast, we will be seating him in the front because the back can accept most travel system car seats. 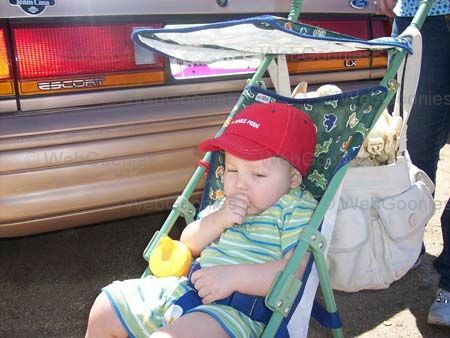 Our old car seat that we do not plan on using any longer in the car may come in handy while in the stroller. We have not noticed any issues with this stroller just yet. Our past single stroller was equipped with cup holders and a thermometer but this new one is not. It would come in handy to have a bit of a place to lay things but we did not feel it was critical. A single cup holder is attached off the side. We'll see how that works out. I think for the price, we found a great stroller. Rylan would like to thank his grandpa very much for the great stroller. Front to back tandem strollers are far and few so with our available choices we are happy. If anything changes, expect me to give an update. Written on March 9, 2007 by Rylan & Kaitlyn. Things are a changing. My mom and dad still try to get me to bed at 9:00pm but sometimes I am just not ready to go to sleep. Last night, I laid in bed while they watched from afar. When I thought they weren't looking I snuck out of bed and then back into bed and then back out again. I just couldn't decide what to do because I knew I was going to get in trouble if they caught me. I decided it was worth it and went ahead and started walking around the room. My mom came in and got me calmed down and sent me back to bed. My dad made us all BLT sandwiches last night. My mom made me a special one with just a little bit of broken up bacon but I didn't like it. Speaking of which, my dad took yesterday off and in the morning he made me an omelette. It sure looked good and I know dad worked hard on it but I just wasn't interested in it. I know dad was a bit bummed when I didn't eat it. I just gave him a sweet look and I know he forgave me. I ended up eating cereal instead. Cheerios are yummy. My mom purchased the Peter Pan movie. I have not seen it yet so I am really interested in checking it out this weekend. I have been on the Peter Pan ride at Disneyland a few times so I have a general understanding of what the movie is about. In fact, I have seen Captain Hook at the Disneyland breakfast we ate during my birthday visit. He was really scary. We took a trip out to the neighborhood that our new house will be built. It had been about a month since our last visit and there are finally some homes coming up. I wonder when they will start ours. We had a chance to walk through our model though and it was fun. I am going to have my own room so I am pretty excited about that. Dad is working on another special project for my room. All I can say right now is that it is Mickey related. I can't wait. Written on March 8, 2007 by Kevin. When Rylan was born, we would give him a bath in a baby tub that we had received from one of our baby showers. We decided to move up to something a bit more when Rylan decided that the old tub was just too easy to get out of. He loved to try and roll out of it. We then went through a few different ideas including a small blow up small swimming pool which turned out to be more of a hassle. After we got tired of it, we ended up finding a small blow up duck tub that worked great for Rylan. 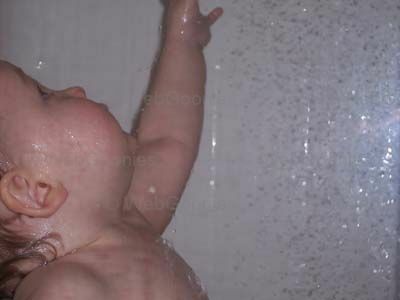 We would put it in our shower and Rylan would walk in and sit down. When he wasn't taking a shower in it, he just loved to be sitting in it. Now that we have our house up for sale we have needed to cut back on clutter. We went ahead and took down the duck tub and decided to give a full shower a try. Rylan took to it amazingly. He loves walking into the shower and standing under the water. He gives us minimal troubles while we wash him and his hair. He couldn't be happier in there. It is amazing on how well he takes to these types of changes. Now we just need to work on getting him not to pee on the shower door. That may take a bit more effort. Written on March 7, 2007 by Kevin. I was born and raised in Arizona which immediately drops you into the land of Mexican food. My wife, born in Texas, is also very accustomed to Mexican food. It's hard not find a Mexican restaurant on each street corner so it's impossible for Rylan not to have a bit from time to time. Quesadillas and simple bean & cheese burritos are great easy foods for toddlers and Rylan has really learned to love these. Mexican restaurants come standard with chips and salsa which employees love to place right in front of Rylan. This caused quite a bit of trouble when we did not feel that he was old enough to have a sharp tortilla chip in his mouth. We soon learned that ordering some tortillas immediately seemed to calm him down as he now has his own chips, even if they aren't hard. Rylan seemed to get bored quickly with just the tortillas so we were looking for something to add to them when we decided to give the mild salsa a try. He ate it up. He can't get enough of it. He has really taken well to dipping foods into sauces such as salsa and ketchup and he now seems to prefer it over the plain food. He certainly has opinions on foods but even at this time, there are few things he will not eat. We are amazed and loving it. Written on March 6, 2007 by Rylan & Kaitlyn. The house has been cleaned, the floors have been steam cleaned and everything has been straightened up. Our home is now up for sale. It's been hard work, lucky for mom and dad I was helping out. This weekend we checked out a few other houses in our area and I think that ours is the best. Our house is only 4 years old and most of the other houses up for sale are over 20 years old. They are not pretty like ours. I think my toys add a bit of touch to our home so I hope people like them as well. Of course, the house won't be coming with them so I hope they don't like them that much. It's going to be weird when people want to come over and look at the house. My mom is going to need to pack up my stuff and head out for a bit. I wonder if anyone will take my toys. That sure wouldn't be fun. It's hard trusting people into your home when you are not there. Hopefully it is not up for sale too long. I am looking forward to eventually moving into our new home that is still being built. It is quite a bit from being finished but I am excited. The house will give me a bunch more room to run around and I will even have my own room. It will be safer because right now we have a 2 story and I don't even want to be tempted by the stairs even though I am blocked from them. Oh ya, we will have a backyard as well which should be fun. Written on March 2, 2007 by Rylan & Kaitlyn. Mom is having a girl! 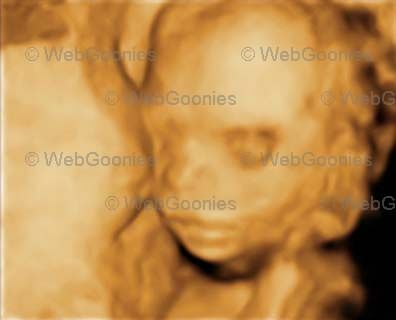 We stopped by the ultrasound office to find out the good news. We all were hoping for a little girl and now it seems that we are going to get one. Yippy! I will have a little sister to pick on and I am looking forward to people calling me a big brother. My dad's birthday was the other day and that was pretty exciting. Mom slaved over the kitchen all day and made him enchiladas and a crockpot style fudgy chocolate cake. I had some of the enchiladas and I have to say, they were great. The cake I didn't get to try so my mom bought me my own slice of cake from the store. Yummy yummy! Dad said he had the best birthday ever and I think it was because of the gift my mom and I got him. Another dress shirt. He sure is dressing like a dad a lot lately. We are going to my grandma's house this weekend to further celebrate. He sure is lucky. Dad introduced me to these wonderful things called apple fries. I really like french fries but dad does not like me eating them too often so he started to cut apples up in the shape of french fries. At first, I didn't realize that I was eating apples but once I had that first taste I was hooked. I never really liked apples until my dad cut them up like this. They sure are yummy. The Peter Pan movie is coming out soon and I am trying to convince my dad to buy it for us. My taste in movies is beginning to expand and I have been seen watching movies like Mary Poppins lately. In fact, sometimes when I want to surprise my mom, I will lay down with her for a bit and watch it. She likes the cuddle time. I think thats about it for this week. It's really exciting knowing that I will be a big brother soon. Now I get to beat up any boyfriends that my little sis has. Yippy. Here is a picture of my little sister covering her ear. Its noisy in the belly. Written on March 1, 2007 by Rylan & Kaitlyn. 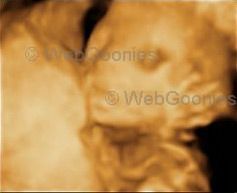 Today, after my dad gets home from work we will be going to the third ultrasound for my little brother or sister. We are all hoping to find out whether I will be soon having a brother or sister to chase around. I am very curious. I will update this post once I have a picture of the little kiddo. Check back tomorrow to find out if I will be having a brother or sister! I know and you don't. Nanner Nanner!